Daisy, also called English daisy, common daisy, bruisewort or woundwort (Bellis perennis) is a perennial plant with herbaceous stems belonging to the plant family of Compositae. Daisy is perhaps one of the most popular in this family, since it is a very common weed in prairies. From a curative point of view, its power lies in its medicinal flowers and leaves, which can be fresh or dried and stored for future medicinal preparations. The flowers contain high amounts of medicinal principles: saponins, tannins, organic acids (malic, oxalic, acetic, tartaric acid), minerals, essential oil and inulin. Depurative and slightly diuretic plant: In the same way than other spring plants, daisy is high in chlorophyll, with very cleansing properties. Daisy leaves are rich in fiber mucilage, a demulcent fiber type, having mild laxative effect. Toning and appetizer: Daisy that can help increase your appetite because it is a bitter tonic, which stimulates stomach secretions. A starter is prepared from the leaves of the plant that have not yet opened. They are preserved in vinegar and are taken as if they were capers, being a remedy for anorexia or loss of appetite. For its antispasmodic properties, it can help remedy digestive cramps. Diaphoretic and febrifuge: Decoctions of daisy flowers can be used in febrile states to promote sweating and help reduce fever. Traditionally, compresses were applied on the forehead, and teas or infusions were use for this purpose. Flu and colds: Daisy is suitable to treat cold and flu that appear on cold seasons. Daisy possesses antitussive properties, so it is present in traditional remedies for coughs and colds. It is appropriate to treat respiratory tract mucus, since it helps the body fight infection and eliminate toxins, besides, due to its diuretic effect, it stimulates sweating. Furthermore, it lowers fever and is an expectorant remedy (Apply a compress on the face or take a tea). 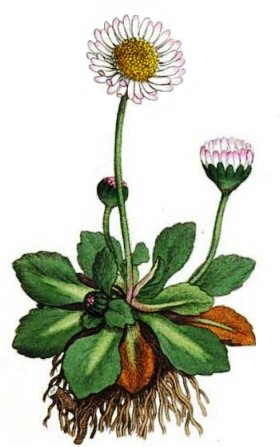 Homeopathy: Daisy is used rather as a homeopathic remedy. It is harvested when the plant is in bloom and its extract is used to treat bleeding. A scientific study valued the effectiveness of a homeopathic remedy to decrease postpartum hemorrhage, and early results showed that it is an effective medicine. It is often used with the same applications than arnica. Breast cancer: homeopathy with Bellis perennis is also used in the treatment of breast cancer. To treat AIDS: Current research is assessing the role of daisy in the treatment of HIV. It is believed that this is due to apigenin, that has proven valuable to treat AIDS virus. However, there is still no conclusive results about it. Vulnerary: This is the main external use of daisy. In general, skin lesions can be treated with this plant, due to its anti-inflammatory and healing properties.. It is used to heal wounds, chewed to treat mouth sores, stop bleeding from a non-serious cut or wound on the skin and against bruising. Also applied as an anti-inflammatory for sprains, injuries, and blows. Rheumatic pain: for its anti-inflammatory properties and flavonoid content, daisy is used externally against joint pain and rheumatism. Some commercial creams incorporate the active principles among its components, such as cream for muscle aches and articular pain Traumeel ®. You can use its flowers and its leaves, but daisy flowers have more content in medicinal components. Infusion: 3g. of dried flowers in 200ml. water. Stand for 10 minutes, strain and serve. Up to three cups a day, away from meals. Tincture: macerate 30g of leaves for 10 days with 120 º C of alcohol (over 60 degrees). Take 20 drops three times daily. Decoction of 100g of flowers and leaves in 1 liter of water. Bring to a boil and turn off heat. Let stand 15 minutes. Filter and use the remedy in compresses, washing, etc.. The fresh leaves, previously washed, can be applied directly to sores and wounds.